How to tell if the kind of technology is suitable for your needs and if so, which model to choose. The electricity and motorized fossil fuel applied to the hydraulic pumps have accustomed to a certain precision in performance: you presse a button and the machine starts immediately delivering the quantity of water provided . Is not environmentally friendly, it has its direct and indirect costs but the performances are generally readily quantifiable. When it comes to renewable energy , things change a lot. To protect customers , it is necessary that the choice of a technology like ours passes through the knowledge of its features , so that it is a conscious choice. The approach must be different from what we’re used to with traditional machines , otherwise you may not get what you expecte and be disappointed. At the moment there are no other solar thermodynamic pumps with which compare the performance of eliopompe Nova Somor, and not even international laws that say how the measurements should be made. But more or less we can apply the same logic and the same dynamics typical of photovoltaic : to understand which model to choose, and which is the eliopompa that suits your needs, you must focus on an average daily flow of water , just as in photovoltaics what matters is the average of energy produced each day . Knowing that a photovoltaic system has a peak power, for example, of 3000 Watts, does not mean that every day we can achieve that energy production and for all the hours in which the sun shines: it happens very rarely and briefly. Each type of photovoltaic panel is tested with an artificial irradiation of 1000 Watts per square meter while the collecting surface is maintained at a constant temperature of 25 degrees centigrade. This helps to determine the yield and to determine the peak power. However, under real conditions the 1300 Watt per square meter of solar energy hitting the Earth’s atmosphere are filtered by the latter and 1000 watts per square meter on the ground do not get it almost never. In any case the panel surface is overheated by decreasing the production of energy up to 30%. The best conditions are, for example, with a radiation next to 1000 Watts per square meter, the time in which the sun is perpendicular to the inclination of the panel, there’s just been a bad storm that has cleared the air and blowing a nice north wind keeps cool the surface of the photovoltaic panels, only then you can reach for a short time the peak power. But if there is humidity, clouds or partialy cloud covered, season or time is not ideal in terms of the angle of the sun relative to the panels, or there is overheating of absorbing surface, the power output also decreases a lot. So what matters for photovoltaics is the average daily production of energy, which is never the peak power multiplied by the hours of sun, but it’s less. If this average production is adapted to your needs, you may go ahead with the purchase and installation. Similarly, for eliopompe Nova Somor what counts is the average daily flow of water, not the maximum. Compared with photovoltaics, there are no problems of overheating, even the heat is always welcome.There are no energy losses due to equipment and intermediate steps. In addition we have the advantage that, if it comes to irrigate, the machine adapts itself to the needs: there more sun there is to drie the earth and dehydrate the plants, the more water is used, and more the machine works. On the other hand when it’s covered or damp, you need less water or nothing and our eliopompa works a little or doesn’t work at all. Therefore, we have a machine that adapts itself to the needs, adapting to the thermodynamic cycle of water of nature and plants. The maximum flow rate is instead the performance that the machine can do in the best conditions, which are the following: clear sky and free of humidity with the sun perpendicular to the inclination of the panels ( in any case necessary for a proper evaporation of the gas ) and water to be lifted at a cool temperature that increases the thermal delta to transform into pressure delta. 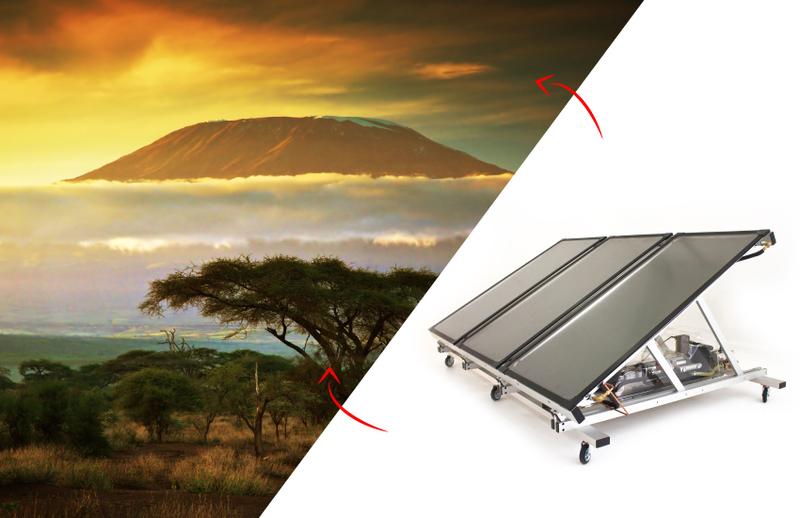 So, for example, for the same season, and same clear sky, the same eliopompa can raise more water if it is located in the park of Kilimanjaro in Tanzania at high altitudes, where the sun’s rays are the ones of equator and have to go through less atmosphere, and where the water is icy glacier, compared to the exact same machine set to lift the warm water of a shallow channel in the wet and “Nordic” Po Valley. So for “maximum capacity” we mean the one obtained under the best possible conditions. Instead, the average daily flow is expressed with a delta of variability and is the one to be taken as a reference in the selection. So an Eliopompa with maximum 3000 liters per hour declared, most of the time, due to the humidity in the air , time in which the sun is vertical to the panel because it is morning or afternoon , and other climatic factors , it will deliver between 1,500 and 2,500 liters per hour , for an average daily flow of between 7000 and 18000 liters . If you need more capacity than our larger model or a constant flow because you have a farm, and the animals drink also when it’s cloudy, or because you still want to always have water available, then you need to integrate the system with other instruments. The first and easiest is to fill a storage tank to stock such as when the sun shines again after the rain you have the water you need: no need to irrigate immediately , but the eliopompa can work and store water for when it will serve to irrigate again . Or you can buy one of our burners / kettles , with little wood or other poor fuel , can run our eliopompe even with covered skie or at night. In case of emergency or for unforeseen water requirements, however there is always a lever for the manual operation that allows to raise the water.